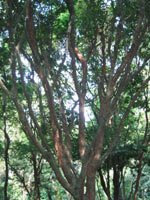 A small tree confined to two areas in the Philippines, which produces a hardwood timber that is highly valued locally. Philippine teak produces a valuable timber used locally and nationally for construction. It is also used locally as firewood. 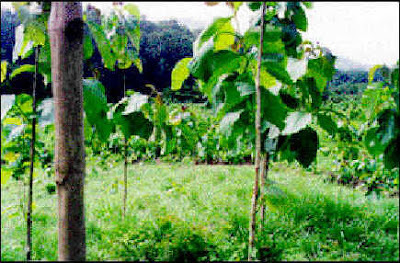 It is one of only three species in the genus Tectona, which includes the commercial teak Tectona grandis, one of the few tropical timbers successfully grown as a plantation crop. Philippine teak may have potential as a genetic resource for future teak breeding programmes aimed at improving supplies of this highly popular wood. Philippine teak is only known from Batangas province, Luzon Island and Illing Island, Mindoro, in the Philippines, where it is confined to limestone forest. Recent information suggests that it is found in highly disturbed forest edge, surrounded by agricultural land and degraded forest. Philippine teak produces a durable timber used locally for construction, being favoured as posts for housing etc. Trade is mainly domestic rather than international. Immature trees are said to be preferred for building materials, thus threatening the reproductive survival of the population. It is also used as firewood. Philippine teak is threatened by habitat destruction and over-exploitation for timber and firewood. The forests where it occurs are becoming increasingly small and fragmented as land is cleared for agriculture and other uses. The preference for immature trees for timber is an additional threat, since fewer trees reach reproductive age. A conservation programme is needed to re-establish a stable natural population of T. philippinensis in its known habitat. A rapid assessment of the species and long-term ecological research is required to determine the physical and biological characteristics of the habitat, coupled with a recovery and management programme, public education, community consultation and resource stewardship, and policy initiatives. As part of the Global Trees Campaign, FFI has funded a recovery programme for Philippine teak, including all the above elements, led by the Philippine National Museum in Manila. The programme includes meetings with local stakeholders to integrate their concerns into the activities, and work on effective propagation of the tree for replanting. Work has been conducted in local schools to raise awareness of the plight of this rare tree. The programme involves local and regional representatives of the government Department of the Environment and Natural Resources, schools and universities in research, project implementation and monitoring. Attempts are being made to encourage the formulation of local policies for the recovery of the species. Afrormosia is an economically important timber species that is considered an excellent alternative to teak. Pericopsis elata is a gregarious species restricted to the drier parts of semi-deciduous forests in Central and West Africa. It has been recorded from Cameroon, Congo Republic, Côte d’Ivoire, Democratic Republic of Congo, Ghana and Nigeria. It is a tree that reaches a height of around 50 m. The trunk is buttressed to about 2.5 m then fluted. It has a maximum diameter of about 2 m.
This timber species is used for boat building, joinery, flooring and decorative veneers. Italy is the main importing country. Since 1948 trade in timber from P. elata has soared. Levels of exploitation have been unsustainable in all countries and the species’ habitat has declined. Regeneration is insufficient to replace lost populations. Because of concerns over the level of exploitation, P. elata is listed on Appendix II of CITES (Convention on International Trade in Endangered Species of Wild Fauna and Flora). Illegal logging is a major problem in the countries where P. elata occurs. Improved regulation of the trade is urgently needed. In Cameroon there have been recent prosecutions for exports of the timber in contravention of CITES. The CITES Plants Committee has recommended that P. elata is a priority for the CITES Significant Trade review process. This would help to ensure that exports are at sustainable levels. Certified sustainable forest management to Forest Stewardship Council (FSC) standards in areas where P. elata is harvested should be the goal. In Ghana a programme of enrichment planting has been undertaken. This aims to increase the stock of valuable species such as P. elata. It is seen as an artificial regeneration method that is being used to supplement natural regeneration. Enrichment planting plots were established in several areas between 1975 and 1978. P. elata is also one species where trials have been established with the aim of conserving the gene pool and providing a basis for afforestation programmes. In situ conservation of P. elata in forest protected areas is a priority need for the species. National tree of Brazil, Caesalpinia echinata, commonly known in Brazil as pau brasil, gave its name to the country. Years of harvesting and reduction of the Atlantic Coastal Forest have reduced this species to the verge of extinction. Exploitation still continues, however, because its extremely dense hardwood is ideal for making bows for stringed musical instruments. It is also know as brasileto, ibirapitanga, orabutá, pau pernambuco, and pau rosado. Pau brasil is the national tree of Brazil, the country to which it gave its name, and has strong cultural links to Brazil’s social and economic history. In the coastal forest ecosystems of Brazil it has been noted as an important habitat for orchids and other epiphytes. The species is famous for the dye extract taken from the heartwood, although synthetic dyes have now reduced this trade. The timber is highly valued by musical instrument makers for the manufacture of bows for stringed instruments. Pau brasil is confined to the Atlantic Coastal Forest of Brazil, an ecosystem recognized as a global biodiversity hotspot. It inhabits coastal regions with open forest and well-drained soils. Detailed information on the present geographical distribution of pau brasil is scarce, but in the last ten years remnant populations have been found in nine Brazilian states. The species is recorded in reserves in Bahia and Pernambuco. Determining the previous range of the species is also problematic because there are errors in the literature caused by incorrect identification and confusion with other related species. In the past, pau brasil was exploited for the dye that could be extracted from the heartwood. The exploitation of the dyewood dates back to 1501, the original collectors being called brasileiros. Until the mid-nineteenth century the dyewood was exported in huge quantities. Today, the bark and dye extract are used locally for medicinal purposes, and research is being undertaken to determine if the bark can be used to treat cancer.Traditionally pau brasil wood was also used to make hunting tools. The hard, compact timber is almost indestructible and was commercially harvested for use as a construction timber, in cabinet making and craftwork. It is still exported for the manufacture of bows for stringed instruments. During bow manufacture the wood must undergo shaping by heat and water, and then be able to retain the bend after being straightened by the pressure of the bow. It must therefore have the correct density, a straight grain with no knots, and must also be a suitable colour. Other woods have been used to construct bows in the past, but are thought to be of much lower quality. Pau brasil is listed on the official list of threatened Brazilian plants by the government wildlife agency IBAMA, and there is currently a reintroduction programme for pau brasil at Linareas Reserve. In 1997 FFI, with the Botanical Gardens of Rio de Janeiro and the Margaret Mee Foundation, convened a meeting to develop an action plan for the conservation and management of pau brasil. Agreement was reached amongst all participants on the recommended actions relating to different aspects of conservation and sustainable use. As part of the Global Trees Campaign, FFI is currently supporting education and public awareness about the conservation of this flagship species and will be working again with the Rio Botanical Gardens and the Margaret Mee Foundation to carry out a more detailed study into the distribution and conservation requirements of this species. A palm of the uplands with enormous spines that protect the palm heart from predation. 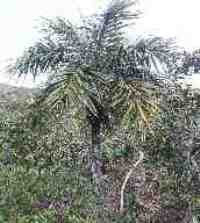 One of three palm species native to Mauritius and harvested for its palm heart There are less than 20 adult palmiste bouclé in the wild. Tectiphiala is a monospecific genus endemic to Mauritius. It is found in the upland forest in the south west of the island. In the past the tree was harvested for its heart, a local delicacy. Harvesting from the wild does not occur any more although there is no specific legislation to prevent this. There is no regeneration of this species in the wild. Fruits are eaten by monkeys and pigs (even within conservation management areas) and successful establishment of seeds is limited by seed predators and competition from weeds. 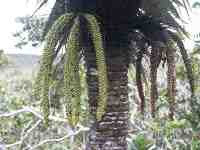 Seeds from the palm are collected and plants grown in the government nursery. So far several plants have been reintroduced successfully to Conservation Management Areas. Why is this species important ?????? This is one of the few species that can survive the extensive periods of drought in all parts of its range and is likely to therefore be an important part of the desert ecosystem. The mature fruits are eaten and, if similar to other species, the sap and fruit may also have medicinal properties. Djibouti, Saudi Arabia, Somalia, Sudan, Uganda. A once widespread and abundant species, it has experienced population declines throughout its range. Scattered individuals remain in inaccessible areas. The populations on the Red Sea Hills and Jebel Elba in Sudan and Egypt are particularly threatened. The fruits are eaten and the sap may have medicinal properties like that of D. draco. The wood, however, is loose, fibrous and therefore unsuitable for building or charcoal. Overgrazing and droughts have contributed to a marked decline in living memory, however, there are no studies into these losses so exact reasons are unknown. Research programmes have been initiated in Sudan and Egypt, investigating the ecology, distribution and threats to the species. Once these initial data have been compiled, a conservation strategy can look into appropriate techniques for reintroduction and restoration. Many people are familiar with the monkey puzzle tree. There is at least one in every botanical garden in Europe. This endemic evergreen conifer species grows naturally in temperate rainforests of south central Chile and adjacent areas in Argentina, reaching up to 2 m in diameter and 50 m in height, and may live for over 1,000 years. A. araucana has great historical and social importance. The seeds form an important part of the Pehuenche indigenous people’s diet (Pehuenche means “people of Pehuén”, the local name for A. araucana). The tree forms characteristic forests, and is valued for its uniqueness and natural beauty, providing important tourism and recreational opportunities. For these reasons, it is the emblem of a number of national parks and provinces in both Chile and Argentina. Due to its high ornamental value, it is cultivated in gardens of Europe and America. A. araucana is also used to reconstruct climatic conditions by measuring the growth rings which may go back hundreds of years. A. araucana occurs in the Andean Range (37°S- 40°S) and the Cordillera de Nahuelbuta Coastal Range (37°S-38° S) of Chile and on the eastern slopes of the Argentinean Andes (38°S–39 S). It grows in mixed forests with deciduous or evergreen species (depending on the location), or in pure stands. A. araucana forests are exposed to a disturbance regime characterized by recurrent volcanism and fire. Volcanic eruptions have caused burial of the land by thick volcanic lava flows. Natural fires started by lava and ejected incandescent material, as well as by lightning, are common in the area. Fires were also started by the aboriginal population prior to c. 1900, and later by European settlers and other groups, often associated with logging and seed collection activities. A. araucana establishes under the partial shade of post-fire stands dominated by Nothofagus species, or may be the initial colonist on rocky sites that have been burned. It has greater longevity compared with Nothofagus species, which is important for the persistence of A. araucana in these habitats. Between November and December female flowers start growing as spherical green cones formed by numerous coriaceous scales. Each cone releases between 120-200 seeds, called “piñones”, which are 4-5 cm long and 1.5 cm wide. These seeds are edible and form an important food source for the indigenous Pehuenche people in the central south of Chile. The seeds have a high carbohydrate content and the collection, storage, trade and preparation of meals from them is a characteristic and important part of the traditional lives of the Pehuenche people. Monkey puzzle wood has a high mechanical resistance and moderate resistance to fungal decay. These properties mean that it has been used for beams in buildings, bridges, piers, roofs, furniture, boat structures, veneers and plywood. A. araucana forests have been rapidly destroyed and degraded due to logging, fire and grazing. 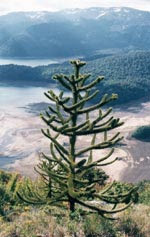 The declaration of the monkey puzzle tree as a Natural Monument in Chile means that logging of the species is now forbidden. The Natural Monument status was revoked in 1987, but it was reinstated in 1990 due to pressure from conservationists and indigenous people. However, there are currently pressures by some landowners to revoke the protection status once more, which would be a serious threat to the conservation of the species. During 2001-2002 thousands of hectares of native Araucaria forest were dramatically burnt in southern Chile. Preliminary information indicates that over 8,300 ha of native forest was burnt in the Malleco National Reserve, destroying 71 percent of the Araucaria araucana forests, and in Conguillio National Park 1,600 ha of pure Araucaria araucana forests were burnt. The cause of the fires is unknown but some local communities say that private owners were involved as they want to the 1990 logging ban to be revoked. In Chile, national parks and reserves that protect the species are concentrated in the Andean ranges. In the Cordillera de Nahuelbuta (Chilean Coastal Range) most of the monkey puzzle forests are privately owned. Burning, grazing and conversion to Pinus radiata plantations have disturbed important areas in the Coastal Range, and these remain ongoing threats. New research has found that these coastal populations have genetic differences from those of the Andes, so their conservation is of great importance. The species is officially protected in Argentina and most populations are within national parks. A. araucana is also listed in Appendix I of CITES, forbidding its international trade. A conservation strategy for the species must consider the expansion of the Nahuelbuta National Park, and the development of new protected areas in the Coastal Range, especially in the southernmost populations. Restoration activities are also necessary for Andean and Coastal populations. Activities should include fine-scale mapping, in order to identify small-sized populations that require urgent restoration measures, and education on the conservation and propagation of A. araucana for local people. The Global Trees Campaign is planning restoration activities for A. araucana forest in Chile and Argentina, including educational programmes. The Cross-Sanaga-Bioko Coastal Forests and Atlantic Equatorial Coastal Forests of Cameroon support about 50 percent of the 7,000 to 8,000 plants endemic to Tropical West Africa, including the critically endangered endemic tree, Microberlinia bisulcata . These biological features, especially the presence of endemic families and genera indicates a long evolutionary past of the eco-region. Why is the species important? Microberlinia bisulcata forms ectomycorrhizal associations with soil fungi. This symbiotic relationship is vital for soil nutrient cycling, particularly phosphorus. Africa, Cameroon, Guinéo-Congolaise rainforest and evergreen coastal forest. Known as zebrano, the wood has alternating black and white stripes, making it a desirable decorative wood. It has been used for furniture, veneer, inlay, turning, and carving. The wood fetches high prices on the international market, leading to excessive timber extraction. Koru National Park does provide in-situ protection but more is required, such as the ex-situ conservation effort being developed by La Station de Recherche Forestière de Kumbu au Cameroun. 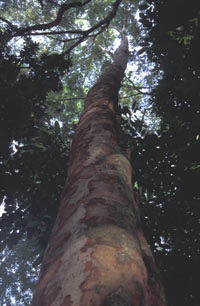 T. heckelii reaches a height of about 60 m. It has a straight trunk that is free of buttresses and has a diameter of up to 3 m.
Tieghemella heckelii produces a fine timber that is commercially valuable. It is one of only two species in the genus. 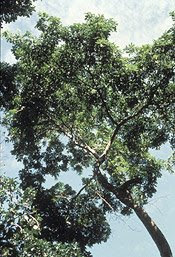 The other, T. africana, is also an endangered timber species of Central and West Africa. Ecologically makoré is important as a source of fruits and seeds eaten by elephants and other forest mammals. T. heckelii is found mainly in wet evergreen rainforest in West Africa. It has been recorded from Cameroon, Côte d’Ivoire, Gabon, Ghana, Liberia, Nigeria and Sierra Leone. Also known as African cherry and cherry mahogany, T. heckelii is a timber species used for furniture, cabinet work, joinery, decorative veneers, panelling, boat building, flooring, turnery, carving, marine plywood and many other applications where a quality hardwood is required. 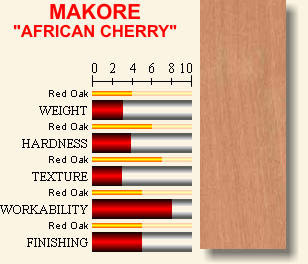 In musical instrument production it has been used for pianos and harpsichords, with the most highly coloured timber currently figuring as the sound board for electro-acoustic guitars.Makoré has the appearance of a close-grained mahogany, the heartwood ranging in colour from a cherry-like pinkish red to a darker brownish red hue. The grain is most often straight, showing the occasional mottle. Locally the oil from the seed is eaten and the fruit is used to make soap. The forests of West Africa are now reduced to fragments of their former range. In Côte d’Ivoire, Guinea, Nigeria and Sierra Leone the primary rainforests now cover less than 10 percent of their original extent. Ghana has more of its forests remaining with over 20 percent forest cover and Liberia has roughly 40 percent of its original forest cover. Over-exploitation in some countries is leading to serious population declines for makoré, notably in Ghana and Liberia, where the possibility of T. heckelii becoming extinct has been reported. Regeneration may be limited in some areas because of a reduction in the number of seed dispersers, particularly elephants. Illegal or poorly controlled logging are problems in the countries where makoré occurs. Improved regulation of trade is urgently needed. Certified sustainable forest management to Forest Stewardship Council (FSC) standards in areas where makoré is harvested should be the goal.In Liberia, FFI is working with local and international partners to improve the basis for the conservation and sustainable management of forests through forest mapping and protected area management. This palm is endemic to Kauai, the northernmost and oldest of the Hawaiian Islands chain with the greatest diversity of plant species of any island in Hawaii. Pritchardia limahuliensis is found only in the Limahuli valley, growing in lowland moist forest. There are fewer than 300 individuals in the wild and regeneration is limited, mainly because of seed predation by rats and pigs. Loulu is threatened by grazing and other damage from introduced animals and by competition from invasive exotic plants. P. limahuliensis is not yet listed under the US Endangered Species Act.The National Tropical Botanic Garden (NTBG) is currently involved in a restoration project for the species and maintains an ex situ conservation collection. It has been used to make furniture, suports and in naval construction. 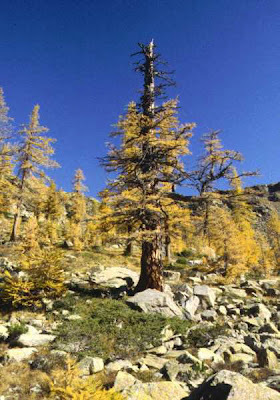 It is the only native larch in Romania and is a distinct subspecies with cones that are smaller and have a more concave, rounded scale than L. decidua. The primary threat is from over-harvesting for timber. The embriogenesis of the species from the Bucegi National Park has been studied at the Faculty of Biology of the University of Bucharest. It is also protected under national laws (237/1950, 137/1995 and 5/2000) from picking and uprooting, and local government agencies are aware that the plant is in protected areas. There are ex situ collections of this species in various botanic gardens and arboreta in Romania, but the seeds are not yet stored in a seed bank. This timber species grows to a height of between 15 and 30 m and has a diameter of about 1 m.
The timber of Honduras rosewood is highly valued on the world market particularly for use in musical instrument manufacture. Exports have taken place since 1841. D. stevensonii is found primarily in Belize in Central America where it is restricted to the southern part of the country. It occurs in fairly large patches along rivers but also on inter-riverine and drier areas, mostly between the Sarstoon and Monkey rivers. D. stevensonii produces a timber that is hard, heavy, durable and very resonant. In general the denser a wood is, the greater the volume of the note that can be produced acoustically from it, when struck or otherwise made to vibrate in air. 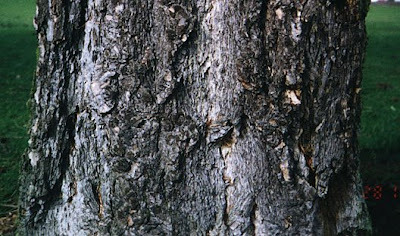 As a dense wood, D. stevensonii produces a clear, loud note when struck and has found itself most highly valued in the production of orchestral xylophones and claves. Owing to its hardness and durability it is used as fingerboards for the violin family of instruments. It is also used to make veneers for fine furniture and cabinets, the backs of brushes, knife handles and for fine turnery. For more information on music woods, try the SoundWood Project page. The conservation status of Dalbergia stevensonii has not been evaluated using the IUCN Red List categories and criteria but felling for timber has depleted stocks of the species Dalbergia stevensonii and it is likely that this species would qualify for the IUCN Red List. An evaluation of the conservation status of Dalbergia stevensonii using the IUCN Red List categories and criteria is required.Certified sustainable forest management to Forest Stewardship Council (FSC) standards in areas where it is harvested should be the goal.FFI is supporting sustainable forest management and income generation in areas adjacent to the Golden Stream Corridor Preserve, in Toledo District, as part of the overall biodiversity strategy for the area. A training programme is being provided for indigenous communities to develop sustainable forestry management and a tree nursery is being developed for Dalbergia stevensonii and other species. Kokia drynarioides is a tree found in Hawaii's dry forests. Almost 90% of these forests have been destroyed and with them 10% of Hawaii's native plants. The loss of this habitat has resulted in the designation as endangered of many of the Hawaiian honeycreepers, birds unique to Hawaii, which have co-evolved with many Hawaiian plants.K. drynarioides is a spectacular member of the hibiscus family. It is a small tree that grows to 10 m and has star-shaped leaves and large red flowers. It is well established in cultivation following the dispersal of large numbers of seeds to botanical gardens all over the world in the early 1900s and is sometimes used as a garden and ornamental plant. K. drynarioides is found only on the island of Hawaii in the central Pacific Ocean. A few individuals grow in the dry forest on the lava fields at Pu'u Wa'awa'a and Kaupulehu in the North Kona district. Only four individuals are known from the North Kona district and the species is not reproducing in the wild. 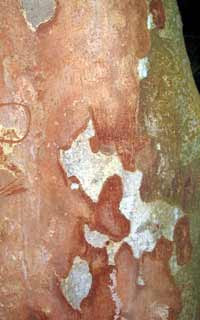 Traditionally Hawaiians have used the bark of K. drynarioides to make red dye that is used to colour fishnets. It is also used as a medicine to prevent thrush. In the early 1900s collectors had already declared K. drynarioides to be "exceedingly rare". In 1984 it was listed as Endangered under the US Endangered Species Act. At that time it was known from a single population of 15 individuals. K. drynarioides is one of only three threatened and endangered Hawaiian plants (out of 293) for which the US Fish and Wildlife Service has designated habitat critical to the survival and recovery of the species. Extensive grazing has resulted in the loss of trees and habitat for K. drynarioides. The tree is still threatened by the continued browsing of domestic cattle and feral animals that has prevented the growth and establishment of young trees. Wildfires are a threat to the remaining trees. Fountain grass Pennisetum setaceum is an alien species that has now covered the once barren lava substrate. It helps to fuel wildfires as well as competing with native tree seedlings for light and water. Following the designation of critical habitat for K. drynarioides, management goals include the reduction of threats of fire and damage by animals, habitat improvement to encourage natural regeneration and the planting of trees that have been raised in nurseries. The state and federal government is also considering an alternative route for a proposed saddle road realignment that will avoid rare dry forest and habitat for K. drynarioides. The Red Data Book of Cape Verde classifies the species as "Endangered", while it is known to be extinct in the wild on Brava and Santiago where only planted specimens exist today; it is also at severe risk of extinction on the island of S. Vicente where it is classified as Critically Endangered. In the Greek myth, "The Eleventh Labour of Hercules: The Apples of the Hespérides", there is mention of Landon, the hundred-headed dragon, guardian of the Garden of the Hespérides. In order to fulfill Hercules’ task to bring back three golden apples from the garden either Hercules or Atlas kills Landon the dragon, depending upon the version of the myth. Landon's red blood flowed out upon the land and from it sprung up the trees that we now know as 'Dragon Trees'. The species is found on the Canary Islands, Cape Verde Islands (Sto. Antão, S. Vicente, S. Nicolau, Santiago, Fogo and Brava), Madeira and Morocco. 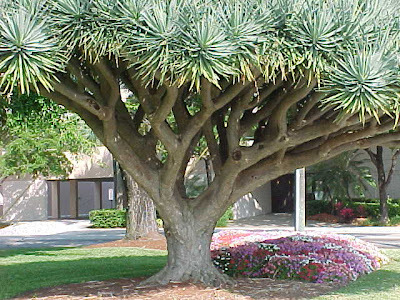 Approximately five hundred years ago the fruit of the Dragon Tree was the staple food of an endemic, Dodo-like, flightless bird that is now extinct. The processing of Dragon Tree seeds through the digestive tract of this bird helped stimulate germination. It is possible that the loss of this bird species has led to a decline in naturally occurring Dragon Trees. It is becoming very rare and seed must be manually processed in order to germinate. 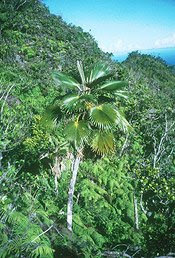 The species is protected under national law from picking and uprooting and efforts have been made on the islands to make people aware of the plant and the need for its conservation. There are ex situ collections of this species. The creation of a network of protected areas is in progress on the Cape Verde Islands but until now no protected area has been established (with the exception of some uninhabited islets). Some of those areas foreseen as protected areas will include part of the populations of Dracaena draco and Sideroxylon marginata. The Clanwilliam cedar is a majestic tree of 6-18 m in height, endemic to the Cederberg Mountains in the Western Cape Province of South Africa. 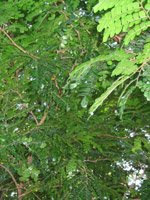 The Clanwilliam cedar is one of the few trees found in the shrub-dominated fynbos vegetation of the Cape region of South Africa. Historically it played a critical role in the development of thearea, being an important source of timber for the early European settlers in this large ly treeless region. From the beginning of the eighteenth century, its fragrant, rot-resistant and aesthetically beautiful timber was extensively exploited for building, furniture and later for telegraph poles. Although harvesting of live trees has been banned for the past 100 years, the Clanwilliam cedar is still a characteristic and much-valued component of the Cederberg Mountain vegetation. The Clanwilliam cedar is only found in the Cederberg Mountain range in the Western Cape Province of South Africa. The mountains lie between latitudes 32° 00’S and 34°45’S and longitudes 18°50’E and 19°25’E. The cedars grow on cliffs, rocky outcrops and slopes, largely between 1050 m and 1650 m above sea level. 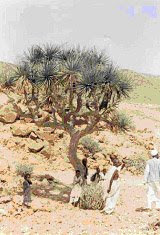 In the northern part of its range, the tree appears to occur mainly on the eastern slopes, but no such limitation exists in the rest of its range. In the early nineteenth century travellers to the area wrote of a forest “24 miles long and two miles wide”. Today the cedar occurs as individual trees with many dead relicts over a much-reduced area: it is estimated that an area of 60-70,000 ha of dense woodland has been reduced to 25,000 ha of scattered trees. If they do not succumb to fire, the cedars can live for up to 400 years. The Clanwilliam cedar was extensively exploited for timber in the eighteenth and nineteenth centuries, initiated by the arrival of the early European settlers in the region. It produces a fragrant, durable timber with an attractive appearance, which was used for construction, furniture and telegraph poles. Harvesting of live trees has been banned for the past 100 years. A combination of factors seems to have led to the decline in the species. The extensive exploitation by man clearly played an important role in diminishing numbers in the eighteenth and nineteenth centuries, although evidence suggests that the ecological situation of the cedar was fragile even before that time due to climatic changes. Although harvesting of the trees has been banned for 100 years, the number of cedars has continued to decline and there is little sign of re-establishment of young trees. An increase in the frequency of large-scale, intense fires is believed to be responsible, although fire is also essential for the natural regeneration of the species. It takes up to 30 years for a tree to bear seeds, and it seems that the increased frequency of fires means that few saplings live to reproduce before fire kills them. It also appears that the seed bank in the natural stands of mature trees has fallen below a self-sustaining level. A large fire in 1989 destroyed hundreds of trees and is believed to have been particularly significant in the recent failure in cedar regeneration. Consumption of the seeds and young shoots by rodents has also been cited as a contributory factor. Without large-scale planting of seedlings, the Clanwilliam cedar is unlikely to recover. An IUCN action plan for the species concludes “the only option open to increase cedar numbers is now found to lie in a large-scale planting scheme of nursery-grown seedlings in newly burnt areas a nd careful management of the burning regimes.” Fires need to be prevented or controlled until seedlings have reached reproductive maturity (15-30 years). Western Cape Nature Conservation (WCNC) established a cedar nursery and planting programme in the late 1980s, but due to lack of funds, it had to be abandoned in the late 1990s. As part of the Global Trees Campaign, FFI is now assisting the Botanical Society of South Africa, working with the WCNC, to re-establish the nursery and planting programme.